Yay! Can’t wait to see all the good data this brings us. I was looking in Google Analytics, I believe I had setup it somehow and put the code ID in store settings. However, I have no idea if I it is setup correctly and what will be “good options configurations” to use in Tindie. I found Google Analytics to be a huge (somehow complex) tool that I understand the importance of use, but I don’t want to spend a lot of time learning it. Does it make sense to make a small article explaining “Google Analytics & Tindie for Dummies”? Or if not, maybe point some suggestion of other online tutorials. Thanks for setting this up, Emile! To find out if a web property is using Universal Analytics, sign in to your account and go to the Admin page. Select a property from the dropdown in the Property column. A Classic Google Analytics account has an option in this column called Tracking Code. A Universal Analytics account has an option called Tracking Info that includes more Admin settings like Session Settings and Organic Search Sources. These additional settings are only available to Universal Analytics properties. 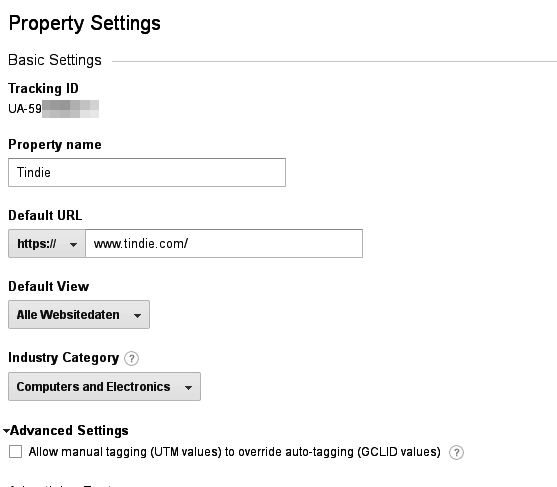 If you have these settings, you have a Universal Analytics property. I set up my analytics code when Tindie first launched analytics support, and it’s a universal one, so it’s likely you have universal analytics too - but it’s definitely worth checking to be sure. Sorry to bore you but I have checked my analytics account and I have not found nothing to move in some way to universal analytics. My actual version - as for as I see -, that I already use for my sites is almost complete, with real time accesses, a lot of audience type subdivisions, the acquisition information, pages, places, referrals and so on. Lot of graphics. Frankly I can’t imagine what can be more in the universal version. Some idea on how I can find it ? 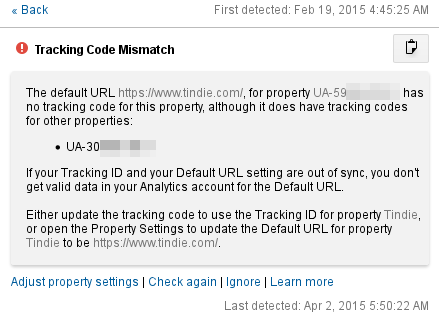 Google now tells me there is a “tracking code mismatch” for “tindie.com”. I probably have messed up the setup process somewhere. 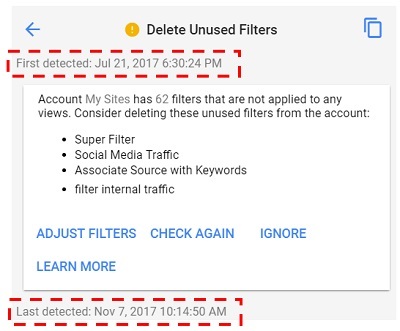 Learn to understand and fix Google Analytics tracking notifications. The tracking java-code sometimes shows two tracking codes, one for user tracking (mine, correct), one for site tracking (something else). If I browse on “my” pages, both codes show up. This is not limited to one URL, so I’m not quite sure which to register with google for the tracking. We are trying to setup ecommerce conversion tracking. It seems to do this we need to know the final checkout page filename… I.e. thankyou.html. Can you provide us with this? Hey David. The URL is tindie.com/checkout/success/ (there is no .html associated with the url). We will have a feature coming soon to show you the conversion. I bump thee, so you can hopefully help me! @madworm how can I help? I can’t do more than entering the numbers given to me by tindie. I’ve checked it again just now. What should I enter for “default URL” in googles UA setup? @madworm https://www.tindie.com/ should be fine. I’ve requested a re-check. Let’s see what google says tomorrow. It’s a simple change, and it would make it possible for us to generate links on our sites that propagate the same Google Analytics session to Tindie - making the whole thing look like one big site for analytics purposes. “_setAllowLinker” is a method on the older ga.js – now that we have switched over to Universal Analytics we are using the newer analytics.js which doesn’t appear to have this method (see https://developers.google.com/analytics/devguides/collection/analyticsjs/method-reference). If there is a way of doing this with analyics.js I’m happy to try it out, I just couldn’t find anything.